​Key Features: Uniform size and conical shape; stunning autumn foliage; easy to grow; vibrant healthy summer foliage. Supplied: In a three litre container of peat free compost, healthy and well established, approximately 120cm (4 feet) high, with full planting and aftercare instructions. 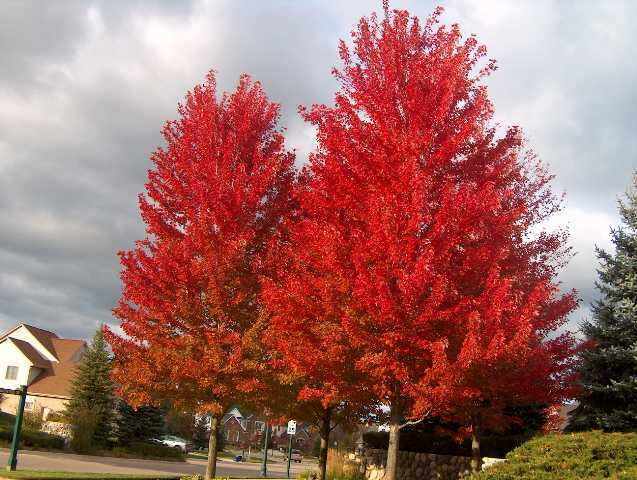 Developed at the US National Arboretum during the 1930's by Mr Oliver Freeman, the Celebration Maple is a hybrid of the Silver Maple (Acer saccharinum) and Red Maple (Acer rubrum). Freeman knew that crossing the two species would produce hybrids containing the best attributes of each species. Acer x freemanii 'Celebration' gets its fast conical growth from the silver maple and vibrant yellow, orange and red autumn colours from the red maple. They have a convenient habit of naturally maintaining a neat upright pyramid that does not require pruning to keep in shape. The branches are uniform, well formed and not likely to break under pressure from strong wind or loads of snow which makes them well suited for exposed positions. This stunning, easy to grow maple guarantees a vibrant display of autumnal colour on any reasonable garden soil. Its upright ascending branches make it suitable for medium to large gardens, to be used as a beautiful stand alone specimen or along large borders and boundaries. As well as top notch autumn colour display, Celebration Maples have little red flowers appearing in April, followed by vibrant green leaves in summer.. An excellent choice to commemorate any celebration is your family. Fully hardy.